More Than SAT is committed to helping students excel in high school and college so they can enjoy their education and make the most of their unique talents. The links below will direct you to the specialized services we provide. Relates well to a broad spectrum of students. More Than SAT relates well to a broad spectrum of students and caters their methods to their specific needs. We also like the fact that you are not trying to push services that we don’t need. Thank you for all you’ve done to support my son through this exciting process. His confidence and competence blossomed with your cheerleading, guidance and counsel. We’ll keep you posted as results arrive! More Than SAT relates well to a broad spectrum of students and caters their methods to their specific needs. Jr. WRITING PROGRAM: Write On! In spite of my initial hesitance, More Than SAT has proven to be a godsend. Thanks to their assistance, my school will cover all of my cost of attendance for the upcoming school year. My brother, too, has received a significant amount of financial aid from his school of choice…In the middle of a very difficult year, More Than SAT has proven to be a beacon of comfort and security for our family. - Jenny, student at Cornell Univ., graduate of New Trier H.S. I am way ahead of my friends. I really want to thank More Than SAT for all the ways they helped me prepare for my standardized tests and college essays. But once I got to college, I realized how well they equipped me for what to expect from college. I feel like I am way ahead of my friends in going through the learning curve as a freshman in college. More Than S.A.T. was an invaluable guide through the college application process. The consultants advised me on recommended schools based on what I wanted and what I needed. I especially appreciated their help with the multiple essays I had to write. It truly made a world of difference, and I can say that my school is the perfect fit for me! - Joe, student at Eckerd College, graduate of Barrington H.S. 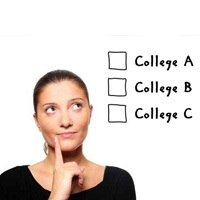 Don’t Make Your Final College Decision Yet! Karishma, student at Illinois State Univ., graduate of Conant H.S. Your guidance opened a door. I knew my son’s grades and scores would not get him into a prestigious engineering school, yet I was still disappointed about him ending up at a small college we’d never heard of. But I want you to know that he has now qualified for WashU’s Dual Engineering Program with a scholarship, and will be starting his two years there this fall in their BioMed Engineering division. You provided him with this option that neither of us knew existed. Your guidance opened a door for him, and I want to thank you for all that you did. Parent of Ripon College/Washington University student, graduate of Libertyville H.S. Keep up with the latest news from More than SAT. Sign up with your primary email address to receive updates.